We know that our conversion solutions are working because we track the entire path of the candidate from first click through to the hire and determine the most effective and efficient marketing channels. Fusion Marketing Group is consistently able to increase applications and decrease candidate drop off rates, within a fixed budget, for our client partners by continually optimizing their solution suite. A recent case study for Northeast Georgia Health System showed a 10% increase in completed nurse applications over the last 24 months and a 6% decrease in nursing candidate drop off. Healthcare systems spend millions of dollars each year in an effort to recruit high quality candidates for hard to fill job openings, and the advertising expense is a significant portion of the recruitment budget. New research indicates upwards of 90% of visitors to your career website leave without completing the application, and nearly half who begin an application fail to complete it. The result is more dollars being poured into this leaky process in an effort to drive more candidates into the funnel. 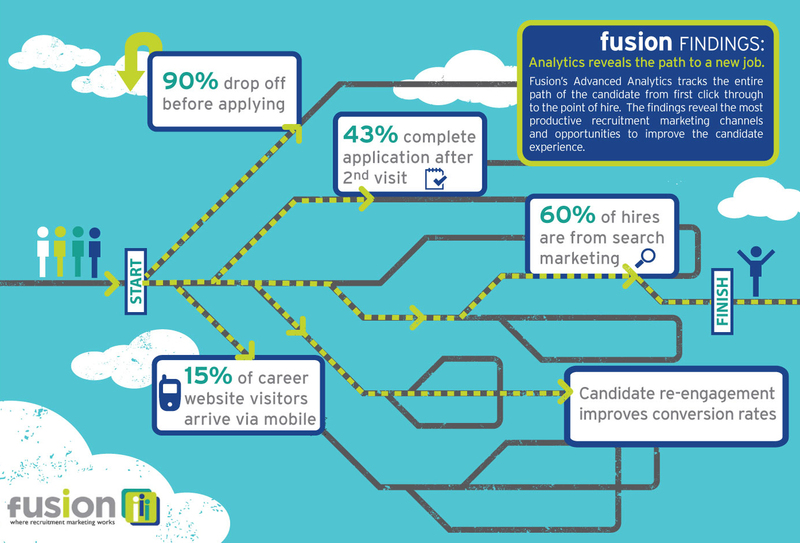 Fusion’s Advanced Analytics and ongoing proprietary market research have guided the development of solutions for career site drop off and ATS abandonment. Rather than increasing the recruitment marketing budget to drive more traffic to the website, we implement conversion programs to turn the visitors to your site into applicants. Through these programs, we see a continual improvement in application completion rates. We incorporate these solutions to decrease candidate drop off during the application process. Generally, we have found that the re-engagement program produces more RN applications than traditional recuritment advertising channels - and at a fraction of the cost.